Over the past ten years, open-plan offices have become the norm. For companies, it makes sense since they can put more employees in a smaller amount of space. 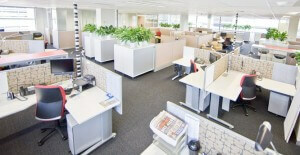 Open spaces also give ample opportunity for employees to collaborate. Despite these benefits to the organization, employees are not always pleased with them. Their complaints include decreased privacy, increased noise and visual distractions. Employers can mitigate some of these issues by installing office panel extenders. Here are some ways that they’ll make your employees happier and more productive. For employees, one of the biggest issues with an open-plan office is the lack of privacy. Conversations can easily be overheard, making it difficult to focus. It’s not just the people right next door that can be heard either, it’s every worker in the area. It is difficult for introverted people to speak to a client, co-worker or supervisor in these situations. This is important to note because one-half to one-third of the workforce falls within this category of personality types. By minimizing the external noise from co-workers, these employees can focus on their work and are, therefore, more effective. When employees are distracted by those around them, whether it’s because of talking or because of movement, their productivity naturally decreases. Any business owner or manager will easily recognize what that can do to the bottom line. According to researchers, a happy employee is more productive. Small things like giving praise, an occasional sweet treat and, yes, creating more private spaces can increase happiness. It’s a win-win situation for employees and employers. Although it may not be possible for most companies to return to the days when private offices were dominant, there are some ways to reduce the issues. Creating private spaces that workers can use for at least part of their work day is one option. These spaces can be shared by employees, giving each a set amount of time to work in privacy before returning to their cubicle. Another option would be to install office panel extenders with sound-deadening fabrics to help minimize the external sounds and other distractions. If your employees are not happy and productive, it’s in everyone’s best interest for you to find solutions to the problem. We understand how important these issues are to you and your success. Contact us for more information about office panel extenders and how they can help create a quieter, more productive workplace for all. Increase Your Employees’ Productivity by Increasing Their Privacy!